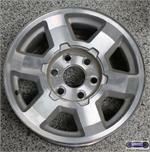 5242, Used Rims, 17X7-1/2, 6 LUG, 5-1/2", 05-06, CHEVY, YUKON, 6 SPOKE, ULTRABRIGHT FINISH, ALLOY. 5242, Used Rims, 17X7-1/2, 6 LUG, 5-1/2", 05-06, CHEVY, YUKON, 6 SPOKE, ULTRA BRIGHT FINISH, ALLOY. Price: ORDER UNDER 5193 CENTER CAP. 5242/5193, CENTER CAP USED, 05-06, GMC, YUKON, YUKON XL 1500, ULTRA BRUSHED FINISH, EMBOSSED GMC IN CENTER, 6 SPOKE DESIGN, 6 SETS OF PLASTIC CLIPS, 8-1/2" DIA. ORDER UNDER 5193 CENTER CAP. 6597, Used Rims, 18X7, 5 LUG, 06-08, PONTIAC, G6 ULTRA -BRIGHT, PAINTED SPARKLE SILVER POCKETS, 5 SPOKE ALUM.